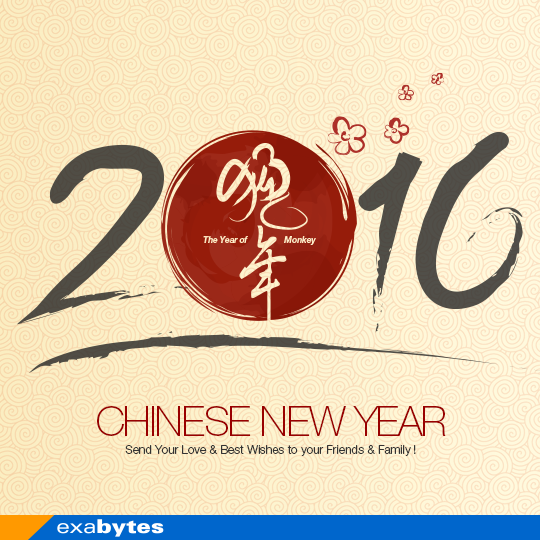 Home All About Exabytes Exabytes Wishes You a Great Lunar New Year! Exabytes Wishes You a Great Lunar New Year! Time really flies – the exciting Lunar New Year is back, and along with it are the red lanterns, red packets, and happy Chinese New Year songs being played everywhere in the malls. This wonderful 2016 is year of the Monkey, ranking in the 9th position in the Chinese Zodiac. The monkey represents cheerfulness, energy and flexibility. Other than that, it also represents wisdom, intelligence, confidence, charisma, loyalty and leadership. On these auspicious days, we would like to wish everybody good luck in everything you do, wishes for prosperity, and blessings of good health and fortune. To celebrate this special occasion, our office will be closed from February 8th to February 10th, 2016, and will resume operation on February 11th, 2016. There will be no phone support during this period, but should you encounter any technical issues, don’t fret! Our professional technical staff will still be working 24×7 to assist you via helpdesk day and night. Lastly, we hope that you would get to spend a fantastic time with your family during this Chinese New Year, watching fireworks and enjoying the festivities between bites of New Year snacks and delicacies! But don’t forget our current CNY Domain Promotion! You can own 5 years domain with 2 years pricing now! And do not forget to make payment via MOLPay. This is because you will be entitled to the lucky draw and win away iPad Mini 4 . To know more about the giveaway contest, please read HERE.